For some of us…change is good! For others…it’s become the necessary evil we endure. Change comes…and then goes…opening the door for new change! 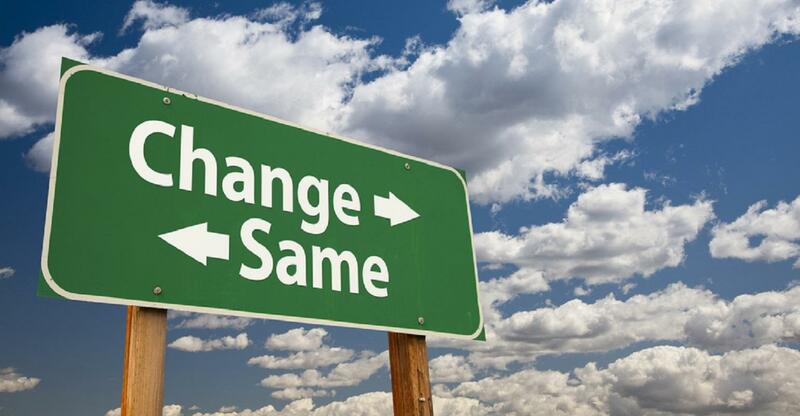 So the question becomes…on which side of change are you? Here are a few examples of change we’ve all experienced or are currently experiencing. Which side of this change are you on? As a child I always noticed the beautiful red tassel hanging from the leather bookmark in my grandmother’s bible. For a long time I wanted one. Now I have no need. I have a vibrant red bookmark in iBooks on my iPad. I also have 8 digital bookmarks at the top of my web browser. The Kindle Fire just got released. I wonder if you can change the color of the bookmark on the Fire. Speaking of the Kindle…a friend was reading a book on the Kindle that I have in print. We were discussing the book and I wanted to reference where she was in her reading. “I’ve read 40% of the book”, she said. I ridiculed her response and pressed her for which chapter that equaled. I was wrong…which side of change am I on? Anyone in the custodial and cleaning services industry should be paying very close attention to these things. Adapt or later it will be agony! In 2005, Lil’ Kim released a single named “Lighters Up”. The song marked the end of an era. For years, lighters were used by the concert audience as a sign of reverence, anticipation and appreciation for the artist. Now, the serene back drop of lifted lighters has been replaced by the flashing red ‘record’ light of video cameras and cell phones. Instead of complaining, which artist will be the first to release the hit song “Cell Phones Up”! Facebook, Instagram, LinkedIn, and Twitter. Are you on or off? Have you even logged in or visited these websites? Do you have personal data uploaded to the cloud? Has your company figured out how to control data privacy in a cloud computing environment? Do you know what cloud computing is? You should…its here! Which side of change are you on? Maybe Mr. Kurzweil’s math can be disputed, but I’m sure we can all agree that innovation and change have quickened their pace. Might be smart if we quickened our pace too. Quicken your pace with change and stay inspired, it’s lifestyle choice! Change is about taking risks… like a wave. You can jump on it and get the most out of it or hesitate and end up having to recover from what could have been and have to get back on your board and keep on going. I choose to ride the waves… or at least know how for when I meet with one! Really good visual appeal on this internet site, I’d give it a 10. I believe this site has some real excellent information for everyone :D. “We rarely think people have good sense unless they agree with us.” by Francois de La Rochefoucauld. Pretty nice post. I just stumbled upon your blog and wished to mention that I’ve really enjoyed surfing around your web posts. After all I’ll be subscribing for your feed and I hope you write again soon!